End your field day event with awards that express all the fun experienced that day. 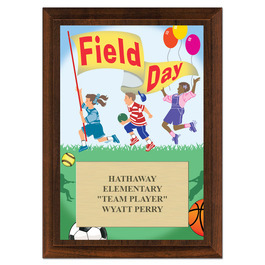 Each Field Day Award Plaque depicts children playing in a bright, lighthearted scene with an engraved gold brushed plate for personalization. Engraving your award plaque with school name, event, recipient, place or dates is always FREE!